A couple weeks ago, our rep from Unitech came by to show off some of their newer products, including the Unitech PA690 mobile computer. The PA690 is built for mobile field services, delivery, and route management, and has some great features to make life easier while on the road. What I really like about the PA690 is the larger than normal screen. At 3.8″ diagonal, the screen is pretty big, giving you a native resolution of 800×480. So now if you’re checking turn-by-turn nav or an auto-updating map, you can see a little farther down the road without having to zoom out. Also, with signature capture apps for like delivery verification, you end up with more space, great for showing a fuller item breakdown or maybe a picture of Ted Danson. Windows Embedded Handheld 6.5 (I think that’s Windows Mobile 6.5) runs on the PA690, so you get a modern looking phone OS plus compatibility with legacy Windows Mobile software. You might need to double check that the software’s designed to run on dynamically-sized resolutions, otherwise it may look chunky or weird. A lot of legacy mobile apps were built with QVGA (320×240) resolutions in mind, so they don’t necessarily scale properly. It’s a thing. It happens. Not only did Unitech beef out the screen to unheard of proportions, but they kept the PA690 pretty sturdy, so even out in the field it’ll keep running strong. The rugged body is built to withstand drops of about 6 feet to concrete, so falling out of holster or off the hood of a truck won’t slow it down. An IP65 seal keeps out dust and low pressure jets of water, and the unit is built to operate in temperatures from 14° to 122° F so neither snow nor rain nor heat nor gloom of night will keep the PA690 from fulfilling its data management duty. The PA690 is powered by a Marvell PXA320 processor rated at 806 MHz with 256 MB RAM and 512 MB of flash storage. There’s also a microSD slot in case you need to load larger inventories, route schedules, or the complete works of Foghat. Slow Ride is pretty great to listen to on road trips. 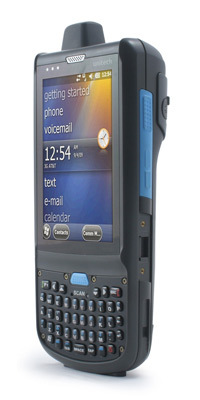 There are two major designs for the PA690, one for general data management, and another with an emphasis on mobility. Both come with Wifi and Bluetooth, fantastic for shipping/picking or ensuring employees have the most current data at their fingertips. There is also a version of the PA690 ideal for use outside the four walls, adding in a GPS radio and 3.5G GSM/GPRS communications. Our Unitechnician friends recently showed off this new mobile computer and it definitely looks like it bridges some gaps and creates synergy and other buzzwords that make it fancy. It’s the Unitech HT680, and it’s a pretty beefy yet not wicked expensive unit. The HT680, to me, seems like an in-between on their big tough PA line and their itty bitty batch device line. Kind of like the Hercules of the Unitech Pantheon. It comes standard with Windows CE 5.0 Pro, a 520 MHz processor, and 128 MB RAM / 512 MB Flash. So it may not be as much of a powerhouse as the PA600, but it’ll get the job done for most folk. There’s also an expansion slot for miniSD cards which can add up to 4 GB of Flash storage in case you want to load a rather large product database, or maybe a couple movies, onto the HT680 for later perusal. For scanning, you get your choice of a 1D laser scanner or 2D imager, so you don’t have to pay for functionality you don’t really need. It’s also set at an angle from the device, much like the Honeywell Dolphin 6100, so it’s no sweat to scan barcodes while still staring at the screen. All the units have Bluetooth v. 2 built-in, and come with an optional 802.11b/g radio in case you need to VOIP it up or update your facebook status while driving your forklift. I guess there are more legit applications, like hooking in to the central database to post and retrieve updates while on the job, so you don’t accidentally send 100 copies of “From Justin to Kelly” out to some poor soul. The design on the HT680 makes it relatively tough, and so you should be safe letting even clumsier people use it. Like most mobile computers kickin around out there, the HT680 sports an IP54 seal, which means dust and splashes of water can’t get in to the electronics, or makes it sneezeproof. And through some combination of light internals (11.2 ounces, so svelte!) and sturdy design, this badboy can withstand drops of 6 feet to concrete. It’s the only Unitech mobile computer that can do that! Last week Unitech held a conference for their 2009 product lineup, as well as a thank you for being so rad. Held in the glorious Palms hotel and casino, the event was a great way to meet the rest of their crew, as well as other resellers from across the country. It also meant I got to spend 3 days in Vegas. Free drinks and penny slots ahoy! Anyway, they’re making a push into the healthcare market, as are we, so it’s a good match. They make really solid products and their support is great, so mission critical environments like clinics and hospitals would do well to get set up with Unitech equipment. Their main offering so far is the PA600 MCA. MCA stands for Mobile Clinical Assistant, and is not a Beastie Boys reference, unfortunately. The PA600 MCA has a couple things to stand it apart from the standard PA600, the first being that it’s clinic white. Really, the paint job is part of an antimicrobial housing, which inhibits the growth of bacteria and other gross critters that can wreck a patient’s day. It also sports an IP64 seal, so water and dust can’t really harm the electronics, and also makes it easy to wipe down or sanitize if someone were to sneeze or get sick on it. For barcode scanning, it has a 2D imager, which actually doubles as a color camera. As such, they use a white light to illuminate the barcode, which could be disconcerting to people at first. On top, or I guess next to, the 2D imager, the PA600 MCA comes with an HF RFID reader built-in. They didn’t opt for UHF RFID because that’d read every RFID tag, bracelet, whatever in a pretty solid radius. It’s tough to check last visit on a patient when you’re getting info on 4 others at the same time. So this is step one into our foray into the healthcare market, hopefully step three is profit.